On March 20, 1345 a planetary alignment occurred that some medieval scholars believed caused the Black Death, otherwise known as the plague. At 1 p.m., a triple conjunction of Saturn, Jupiter and Mars occurred in the 40th degree of Aquarius. Each of these planets were associated with specific bodily humors. These three planets in conjunction held sway over the warm and moist humors that were thought to adversely affect health. In addition to the planetary alignment, two other environmental factors were thought to play a part in the plague’s creation: miasmas, or polluted air, and earthquakes. As the plague spread through Europe, one can understand how the connection was made, as a series of earthquakes shook various cities in Italy and Germany in April 1348. The weather the year was also unusually hot. These were conditions believed to cause unbalanced humored conducive to the development of plague. Of course, every facet of medieval life was dominated by God and the Church. It was probably the only common thread to every class of society, and it was understood by the lowest peasant to the highest King that God controlled everything on earth and in Heaven. Medieval scholars on the whole still held Aristotle’s theory that there were four causes for all things: a maker, a plan, material and a reason. By this line of reasoning, God was the plague’s creator, or “maker,” and the reason this was part of his “plan” was the sinfulness of mankind. The plague was God’s punishment for their wicked behavior and taking their blessings for granted. This was the belief of the vast majority of the population of Europe during the time of the Great Mortality, as the plague was known when it was rampaging through countless cities, towns and villages. Even those learned men in Europe’s universities did not dispute’s God’s hand in the Black Death; they only questioned the extent of his involvement. With the advent of modern medicine, it was discovered that the actual culprit of plague was yersinia pestis bacterium that appeared in Mongolia around 1320. A bit later, a pneumonic form of the disease developed with a 95 percent mortality rate. The Black Death raged for three years, and when it was over, around one-half of Europe’s population was buried in mass graves. The devastation wrought by the Great Mortality ushered in an era of drastic changes to the social order. The massive loss of life meant a shortage of labor, giving the working poor more bargaining power and mobility than they had ever dreamed possible. The nobles in turn enacted sumptuary laws in an attempt to control wages and prevent the lower classes from dressing and dining like their betters, but they weren’t always practical to enforce. The feudal way of life in Europe was dying. 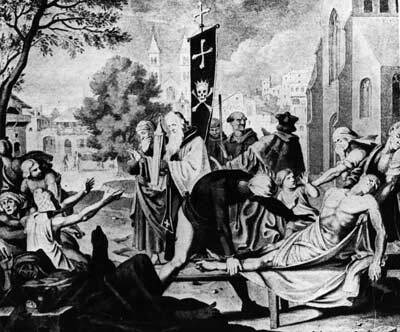 The Black Death, arguably the worst pandemic in human history, was the first step toward the Renaissance, the Enlightenment and the Civil Rights Movement.